Today's giveaway are two beautiful unmounted photo stamps from The Stampsmith. 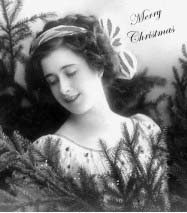 The first image, shown in the card and on the left, is Grace Christmas. I find this image to be incredibly lovely! I think it is because the evergreen in the picture makes me conjure up the smell of pine -- it is a very happy and soothing smell for me. 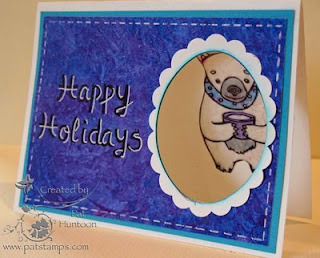 When I was making the card above, I stamped her in black ink on glossy paper, then gently tinted the image with chalk. 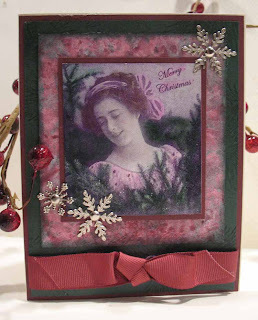 That panel is mounted on burgundy, then on a piece of pink/burgundy/green that was made using the Two-Toned Crunch Technique from the December 2008 issue of the Technique Junkie Newsletter. That piece was mounted on a piece of stamped evergreen paper, mounted again on Burgundy, and embellished with ribbons and snowflakes. 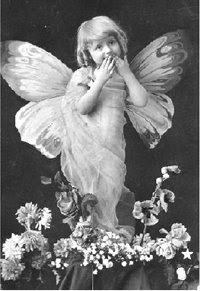 The second image in today's giveaway, on the right, Is called butterfly kiss. I did make a card with this image, too, but it will be shown in the February 2009 issue of the TJ Newsletter, and I did not want to ruin the surprise! You have until Sunday evening, December 21st, 2008, to leave me a comment. I will select a winner using a random number generator on Monday, December 22nd. Make sure to leave me your email address so that I can contact you. You many want to leave it in this format: p huntoon at optonline dot net -- that will help mystify those pesky internet bots. Congratulations to Sharon Briss! She is the lucky giveaway winner! This great stamp set from Firecracker Designs by Pamela is our giveaway for today. Filled with gorgeous images, it is would be a great addition to anyone's stamp collection! To enter the give away for today, simply leave a comment on this blog entry telling me that you would like to enter by 11:59pm EST on Monday December 15th. No other entry methods will be included in the give away. If you email me to enter, your entry will NOT be considered a valid entry. When you leave the comment, make sure to put your NAME in the comment -- if you enter your comment as "Anonymous", I cannot give you the prize! Blogger does NOT record your email address for me, so you will need to check back to find out if you have won or include your email address in your comment so that I can notify you. A good way to do this is like so: phuntoon at optonline dot net -- it will help protect your privacy! I will have a random number generator pick one number from the comments to select one winner. Each give-away is separate, so to be eligible for a specific item you must enter that day's contest on the post where it is listed. Enter today -- good luck! The winner of this giveaway is: Denise Denike! Congratulations, Denise! Our Holiday Blogstravaganza continues with the second Giveaway this week -- for this beautiful set from Our Daily Bread Designs. 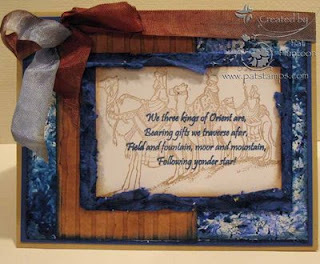 This set (We Three Kings) was used to make the card above, that will accompany the set to the winner of the giveaway. 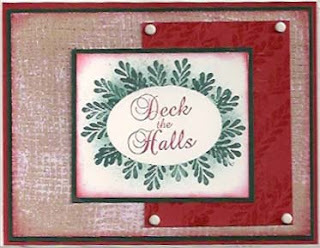 The card uses the Color Pop Technique from the December issue of the Technique Junkie Newsletter as the background, with a Torn Frame (December 2008) around the greeting. Our Daily Bread Designs has free Shipping on orders over $50.00 for US residents (or over $70.00 for folks in Canada). Make sure you check out the new stamps, too! You can also purchase gift certificates with ODBD -- what a great Christmas Gift! Don't forget -- Technique Junkies receive a discount on all Our Daily Bread Designs Sets -- Look in my sidebar for the coupon code. Hurry and enter the giveaway, though -- I am picking a winner by Thursday at midnight! To enter the give away for today, simply leave a comment on this blog entry telling me that you would like to enter by 11:59pm EST on Thursday December 11th. No other entry methods will be included in the give away. If you email me to enter, your entry will NOT be considered a valid entry. When you leave the comment, make sure to put your NAME in the comment -- if you enter your comment as "Anonymous", I cannot give you the prize! Blogger does NOT record your email address for me, so you will need to check back to find out if you have won or include your email address in your comment so that I can notify you. A good way to do this is like so: phuntoon at optonline dot net -- it will help protect your privacy! I will have a random number generator pick one number from the comments to select one winner. Each give-away is separate, so to be eligible for a specific item you must enter that day's contest on the post where it is listed. Enter today -- good luck! The winner of this giveaway is Bobbi Nessly! Congratulations! I know it is Monday, and not our normal Wednesday Giveaway time, but this week we are having THREE giveaways! Monday, Wednesday and Friday! Can't we all use something to bring joy to our hearts while we prepare for the holidays? 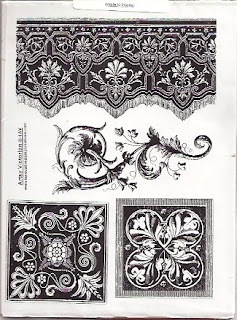 This stamp sheet from Innovative Stamp Creations is called Artsy Victorian, and I have used the gorgeous swirl in the center for the swirl on my Faux Designer Paper card above. This is the most beautiful swirl -- I use it on everything!! 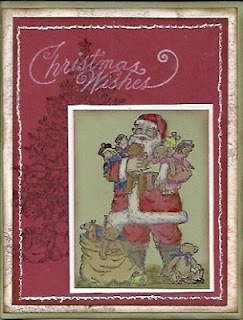 The other stamps used on the card are from another new ISC sheet called Christmas Trinkets. 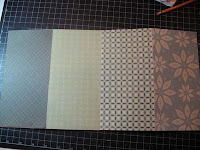 The Faux Designer Paper Technique is featured in the December 2008 issue of the Technique Junkie Newsletter. Hurry and enter the giveaway, though -- I am picking a winner by Tuesday at midnight! To enter the give away for today, simply leave a comment on this blog entry telling me that you would like to enter by 11:59pm EST on Tuesday December 9th. No other entry methods will be included in the give away. If you email me to enter, your entry will NOT be considered a valid entry. When you leave the comment, make sure to put your NAME in the comment -- if you enter your comment as "Anonymous", I cannot give you the prize! Blogger does NOT record your email address for me, so you will need to check back to find out if you have won or include your email address in your comment so that I can notify you. A good way to do this is like so: phuntoon at optonline dot net -- it will help protect your privacy! I will have a random number generator pick one number from the comments to select one winner. Each give-away is separate, so to be eligible for a specific item you must enter that day's contest on the post where it is listed. Enter today -- good luck! Congratulaions to Jennifer Willis, the winner of this giveaway! Well, that is inaccurate. The Poinsettias are traditional -- the way I colored them is not! 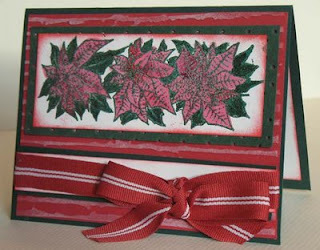 I wanted something more striking than basic red poinsettias -- so I chose to put some light colors on the dark paper. This uses the Faux Bleach Technique for coloring and the Torn Frames technique for the frame. Both are Techniques that can be found in the December 2008 edition of the Technique Junkie Newsletter. This is one of those cards that looks 100% better in person! It looks garish here, but IRL it is elegant. Make sure to check out their gorgeous work! It just so happens that these stamps are on Special, too -- check out the specials on the Clear Artistic Stamp Website HERE. Along with the stamps, you will receive the card shown above, which features the Clear Artistic Stamp image layered over a piece of Feathered Tye Dye, one of the December 2008 techniques from the current issue of the Technique Junkie Newsletter. One entry per person, per give away, please. To enter the give away for today, simply leave a comment on this blog entry telling me that you would like to enter by 11:59pm EST on Sunday, December 7th. No other entry methods will be included in the give away. If you email me to enter, your entry will NOT be considered a valid entry. When you leave the comment, make sure to put your NAME in the comment -- if you enter your comment as "Anonymous", I cannot give you the prize! Blogger does NOT record your email address for me, so you will need to check back to find out if you have won or include your email address in your comment so that I can notify you. A good way to do this is like so: phuntoon at optonline dot net -- it will help protect your privacy! I will have a random number generator pick one number from the comments to select one winner. Each give-away is separate, so to be eligible for a specific item you must enter that day's contest on the post where it is listed. Enter today -- good luck! Congratulations to Roxi Green, the winner of these great stamps! 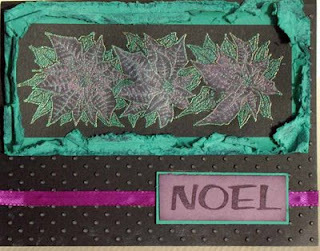 Today's Blogstravaganza submission is an ATC (Artist Trading Card) that I made for a small group I belong to that trades ATCs every month. This uses the Glimmering Silk Technique from the newest December 2008 issue of the Technique Junkie Newsletter. 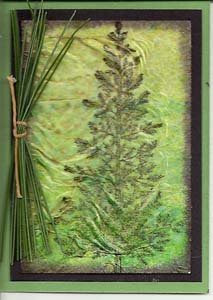 I added a little bundle of pine needles from my front yard for the "Winter Trees" theme. Fabulous Friday Giveaway from Firecracker! This is the second giveaway this week -- all to celebrate our Holiday Blogstravaganza, which started November 1st -- and what could be better on this Fabulous "Black" Friday than these Festive Firecracker Designs by Pamela Stamps! 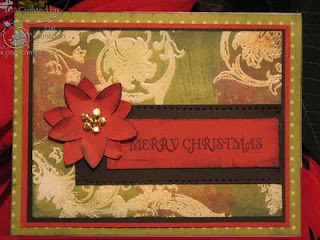 One lucky winner will receive the card and Firecracker Designs by Pamela stamps shown here. 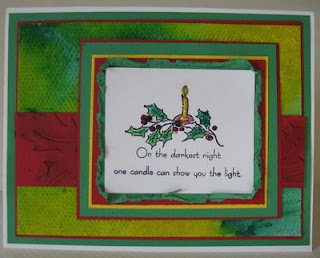 The card was made using two techniques from the newest December issue of the Technique Junkie Newsletter. The greeting was framed using the Masked Frames Technique, and the background is a piece of Painted Mesh. "SHIMMERZ are BACK IN STOCK with 8 NEW COLORS! Oh yes! 8 new colors arrived today, and are ready for shipping!! We are now up to 23 colors of these beautiful shimmery paints! Aileen's Tack Over Glue-Back in STOCK!! Need an adhesive to put on the backs of your unmounted rubber stamps? this is the best stuff!! Just brush it on with a paint brush, wait for it to dry clear, and you are ready to stick your stamps to your acrylic blocks! (available on the accessories page). The beauty of this glue? It lasts a good long time,and since it's repositional, when you are done stamping, just peel your stamp off the block and replace it in it's storage space! NEW NEW NEW!! Subscriptions to RSM (Rubber Stamp Madness) The original rubber stamping magazine!! Now you can renew or start a subscription just by clicking the "Get It" button on the Firecracker Designs by Pamela Site! Remember: TJer's save 10% on every order!! Just use code: ILOVETJS (all one word) at check out.
.**** Coupon is not available on Magazine Subscriptions. Sorry. " One entry per person, per give away, please. To enter the give away for today, simply leave a comment on this blog entry telling me that you would like to enter by 11:59pm EST on Monday, December 1st. No other entry methods will be included in the give away. If you email me to enter, your entry will NOT be considered a valid entry. When you leave the comment, make sure to put your NAME in the comment -- if you enter your comment as "Anonymous", I cannot give you the prize! Blogger does NOT record your email address for me, so you will need to check back to find out if you have won or include your email address in your comment so that I can notify you. A good way to do this is like so: phuntoon at optonline dot net -- it will help protect your privacy! I will have a random number generator pick one number from the comments to select one winner. Each give-away is separate, so to be eligible for a specific item you must enter that day's contest on the post where it is listed. Enter today -- good luck! Congratulations to Peggy Moss, the winner of this giveaway! More Sweets from the Sweet Shoppe! 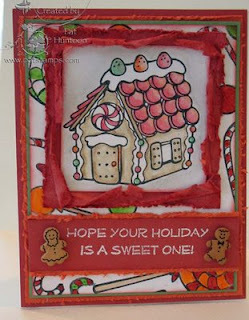 Today's Holiday Blogstravaganza features more Images from Starving Artistamps from the Sweet Shoppe set that I am giving away (see yesterday's post). Make sure that you enter the giveaway by clicking HERE. Today, my peek-a-boo bear from Starving Artistamps usese the Wrinkled Vellum Technique from the just-released December 2008 issue of the Technique Junkie Newsletter. I have a picture of him, alone, on the right -- isn't he cute! This new technique is a way to add color and texture on a flat image. The technique was inspired by a card sent to me from Claudia Phillips. 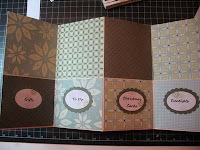 The front of this card uses the Two-Toned Crunch technique from the December issue, too. If you are a Junkie, go take a look -- the link is live (make sure to refresh your screen for the new images). I hope your day is filled with sweet things -- the rest of mine will be filled with cooking! Sweet! It's a Giveaway on Tuesday!!! Yes, you read that right! We have our giveaway on Tuesday this week, and we will have a second one on Friday!! Since this is the season of thanks, it is fitting to offer you my thanks through these extra giveaways...PLUS -- this is also a sneak preview of one of the techniques from the Technique Junkie Newsletter December 2008 issue called Torn Frames (being mailed later this week!). We have packed this release full of great images, 25 of them! With our coordinating sentiment set also available you will be sure to have a lot of fun making your holiday cards this year! As if that's not cool enough we are running a great holiday special! To take advantage of our special simply place your order for the DoodleFactory Sweet Shoppe unmounted set and we will include the sentiments in your package. Its that simple! 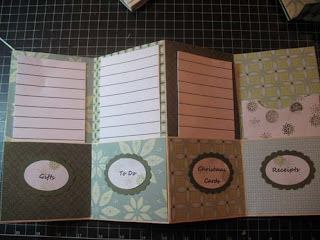 Note: Do not add a set of sentiments to your order unless you are intentionally ordering an additional set! Don't worry, we won't forget your free sentiments! Just place your order for a DoodleFactory Sweet Shoppe set and you are all ready to go making your holiday cards and scrapbook pages! Visit our website today! www.starvingartistamps.com"
The lucky winner of this giveaways will receive their own double package, along with the card shown above. Hurry though -- the winner of this giveaway will be selected Friday Morning. It is going to be sweet for someone! One entry per person, per give away, please. To enter the give away for today, simply leave a comment on this blog entry telling me that you would like to enter by 11:59pm EST on Thursday , November 27th. No other entry methods will be included in the give away. If you email me to enter, your entry will NOT be considered a valid entry. When you leave the comment, make sure to put your NAME in the comment -- if you enter your comment as "Anonymous", I cannot give you the prize! Blogger does NOT record your email address for me, so you will need to check back to find out if you have won or include your email address in your comment so that I can notify you. A good way to do this is like so: phuntoon at optonline dot net -- it will help protect your privacy! I will have a random number generator pick one number from the comments to select one winner. Each give-away is separate, so to be eligible for a specific item you must enter that day's contest on the post where it is listed. Enter today -- good luck! Oh -- and make sure to check out the blogs of the design team members playing in today's Blogstravaganza, too! Many of them have sneak previews of the new Newsletter! The winner of this giveaway is Connie Gage! Congratulations, Connie! Santa brings presents for boys and girls...and for the Blogstravaganza, he brings you cards! 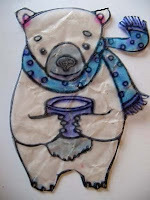 My Santa was stamped on green paper and colored with Pencils and Gamsol (Gamsol Pearls, June issue of the TJNL). He is layered on red cardstock that has been Faux Stitched (April/May 2006 issue of the Technique Junkie Newsletter). That is layered over a piece of Fossilstone (from the same issue). All stamps from Stampin' Up! (retired). Today's Blogger's Challenge was to create something to Give Thanks. What better way than to offer a Thanksgiving Blessing to someone you love? My card uses some retired Stampin' Up! stamps on top of a piece of Silken Mist Background, from the October 2006 issue of the Technique Junkie Newsletter. Poinsettias are such a gorgeous flower. One of my favorites. I love the pink ones, the red ones, the white ones...all of them. So I was thrilled to have this grouping on the stamp sheet from Rubberstamp Ave to play with. The winner of yesterday's Blog Giveaway (click here to enter the giveaway, if you have not yet entered) will have these on THEIR sheet, too. I colored my poinsettias using reinkers, and layered it on a Cuttlebug Highlight (October 2008 Technique Junkie Newsletter) background. Wonderful Wednesday Giveaway - Rubberstamp Ave! 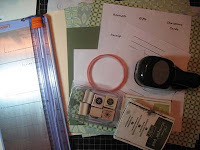 I am thrilled to have another stamp company join our Wonderful Wednesday Giveaways this week! Today's giveaway is from Rubberstamp Ave. The card I made for today's giveaway features this fabulous image of Saint Nicholas -- and he is just part of the stamp sheet for the giveaway! 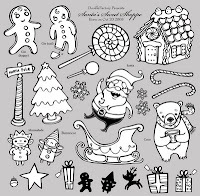 The stamps sheet you will receive contains 8 of the images you see here: the two Santa images, the poinsettia image, the ornaments (both images), the solid flying reindeer and sled, and the words "Noel" and "Merry Christmas". My card uses the Aged Tiles technique from the April 2008 issue of the Technique Junkie Newsletter. 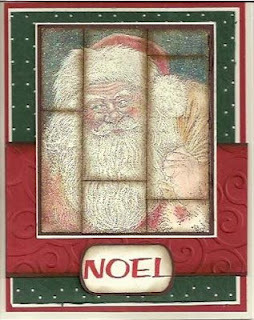 Doesn't almost look like you are looking at St. Nick through panes of glass? The best part is that Rubberstamp Ave is having a HUGE sale right now -- the deals are just unbelievable! Until Nov 30th, save BIG on ALL unmounteds!! This includes individual unmounted stamps, sheets of rubber and grab bags. Hurry over there for some great deals. One entry per person, per give away, please. To enter the give away for today, simply leave a comment on this blog entry telling me that you would like to enter by 11:59pm EST on Sunday, November 23rd. No other entry methods will be included in the give away. If you email me to enter, your entry will NOT be considered a valid entry. When you leave the comment, make sure to put your NAME in the comment -- if you enter your comment as "Anonymous", I cannot give you the prize! Blogger does NOT record your email address for me, so you will need to check back to find out if you have won or include your email address in your comment so that I can notify you. A good way to do this is like so: phuntoon at optonline dot net -- it will help protect your privacy! I will have a random number generator pick one number from the comments to select one winner. Each give-away is separate, so to be eligible for a specific item you must enter that day's contest on the post where it is listed. Enter today -- good luck! I have blog give aways every Wednesday -- come play! Congratulations to Tammy Malone -- the winner of the giveaway! 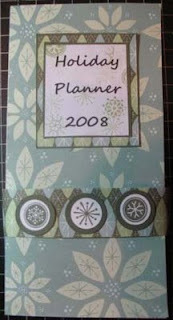 If you are on the TJ e-group, you know that I saw a video for a holiday planner from the blog of Technique Junkie Susan Moore HERE. Once I made one, I asked the group whether they wanted a step-by-step tutorial so that they could look at the pictures and get the dimensions directly; their answer was a resounding "YES!!" This tutorial is very long, so bear with me! I actually cut it down a bit, for the sake of brevity. you can click on any of the pictures for a larger view. With the folder closed, trim the Folder to 8". This will cut off the tabs and allow for even measurements. Open the Folder. 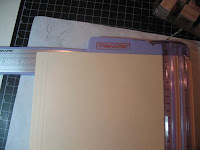 With the centerfold vertical, bring the bottom of the file up 3" and crease to fold. 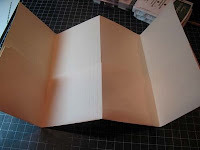 With the bottom flap folded up, have each end of the file folder meet in the centerfold, and fold both ends with the bone folder. Fold the piece so that there is a Valley Fold, Mountain Fold and Valley Fold. 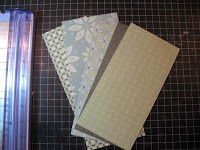 Cut 8 pieces of the Designer double-sided paper to 7-1/2" x 3-3/4". Note: you may have to cut these down a bit for your folder if the measurements are slightly larger or smaller than the brand I used. 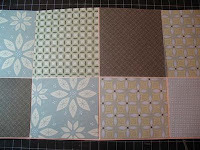 Adhere one piece to each of the 8 panels (four in front, and four on the back). I mixed and matched my designs. 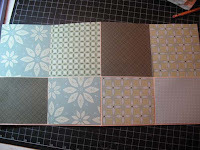 Cut 4 panels to 3-3/4" x 3". Close the fold and attach the 4 pieces to the 4 front panels . Open the bottom fold. 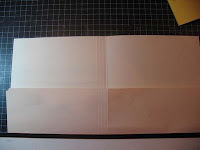 Add double-sided tape to the creased lines, and the two outer edges of the fold. Do NOT apply tape to the bottom edge. 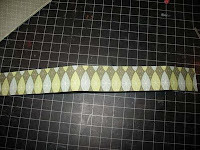 Remove the backing from the tape and fold up; press firmly to adhere. Create labels for the pockets (mine can be found HERE). 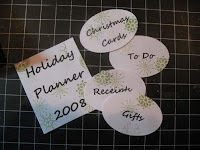 Decorate as desired and uses punches and cardstock to decorate them, if desired. Attach labels to the bottom flaps of the pockets. 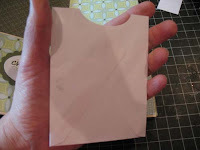 To make a receipt holder, glue the flap on a regular-sized envelope. Cut the top off, then use 1/2 of a circle or oval punch to create an opening. Decorate as desired, then slip into the receipt pocket. 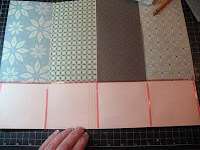 Create a belly band to close the Planner by cutting a 1-1/2" x 12" strip of Designer Paper. 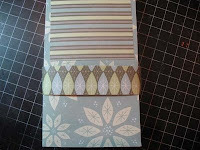 Fold the band around the outside of the planner, overlap the folds by 2-1/2" and use adhere the ends. Cut off any excess paper. NOTE: I made my bands loose so that when I have paper filled in my planner, it has room to expand. Decorate the front of the planner, add paper to the inside (I created my own, using THIS line template), and you are done! I loved this so much, I made THREE! One for me, one for my sister in Virginia (I am visiting there this weekend!) and one for one of my SIL's... I love making these!